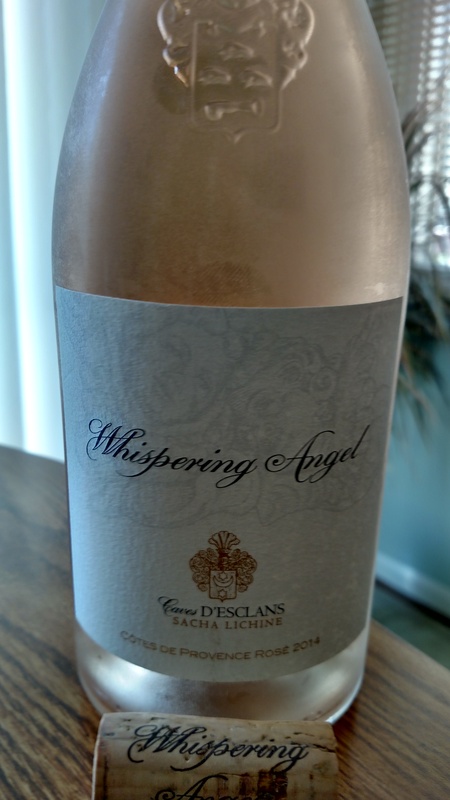 Caves D’esclans Whispering Angel Rosé 2014 | Wine Splash! Those whispering angels can be very persuasive…..taking an unassuming wine and whispering notions of heavenly nectar through the mind and across the palate. Very intoxicating! Who knew Heaven’s Gate was located in Provence, France where these grapes were grown? Primarily Grenache with a smidge of Vermentino and Cinsault. Bright salmon in color with a soft orange hue. The nose is of white peach, strawberry, and pineapple…… an Angels fruit salad? Medium body with fresh and creamy undertones. Flavors of strawberry, ripe red cherry, fresh pineapple, and a hint of Allspice. On the second sip, more citrus flavors emerged with hints of vanilla, ginger, and a sense of minerality on the long, lively finish. This Rosé more than “whispers” summer, it “screams” it! Fun on the patio with friends or the perfect compliment wine for hors d’oeuvres, ham, seafood, summer salads, and mild to medium cheeses. A tasty Rosé with wings! 92 savory points. Around $17 a bottle. WineSplashing! !